The median beautification project in Houston’s Westchase District reportedly promises to improve the flow of traffic, and is just one of several projects in the works near Westheimer. At the intersection of Wilcrest and Westheimer, six median openings are being rebuilt to shape the flow of traffic into something hopefully less congested. The project also aims to improve access to nearby businesses. “On Wilcrest just north of Westheimer, there are several misaligned driveways in close proximity to one another. That, coupled with the high traffic counts, creates a challenging traffic management situation,” said Irma Sanchez, Westchase District’s vice president of projects, in a press release. The left turn lanes on Wilcrest at the intersection will also be extended to allow more cars to fit, easing traffic in main lanes. Median openings will be rebuilt to let drivers make u-turns and left turns more easily. Source: Westchase District official web site. Some wonder if the pedestrians in question are actually panhandlers, known to frequent intersections around Houston and walk between cars or stand on medians asking for money. 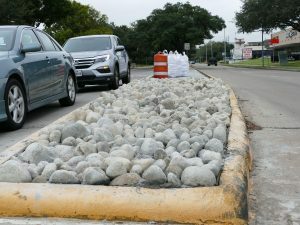 The theory is that the rock-filled medians would be more difficult to stand on, thus deterring anyone from sitting there for a long period of time. Comments on the Reddit thread posted above range from favoring measures like this, and even stricter enforcement of anti-panhandling ordinances, to the attitude that it’s just a band-aid. “I’d contribute to a fund to do this at every major Houston intersection… if I could be sure it would work and we’d see a reduction in the beggars,” said Reddit user ThatGuyInHouston. When pedestrians linger on the medians, it creates a public safety hazard for them as well as for motorists. It’s a subtle and aesthetically pleasing way of directing people to move along and simply cross at the intersection. McKinney said the district plans to install similar landscaping at additional intersections at Westheimer, as well as the Beltway.